TTTS is a condition in which twins share unbalanced blood circulation. This only happens with identical twins (monozygotic) that also have a monochorionic (shared) placenta. 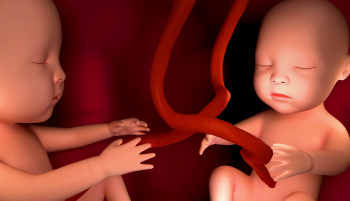 There are almost always connections of blood vessels between twins sharing a single placenta. Yet, for reasons that are not totally understood, approximately 10% to 20% of these pregnancies will develop Twin-To-Twin Transfusion Syndrome, an uneven amount of blood circulating between the two babies. One twin will be smaller because of lack of blood and is usually known as the "donor" twin. While the larger twin gets overloaded with blood and is usually known as the "recipient" twin. There is no genetic predisposition, nor is it caused or prevented by something the parents do. Simply stated, every monochorionic twin pregnancy will be totally different. There is no way of knowing ahead of time if this will happen to you. There are 5 stages of this syndrome from mild to severe and just as many treatments. With severe cases there is, unfortunately, still a pretty high mortality rate (however, this continues to improve with advancements in treatments). While mild to moderate forms of the syndrome often result in premature birth. Once diagnosed, careful monitoring will have to be implemented to find the best course of treatment. 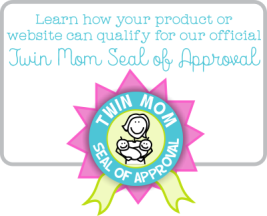 That's why it is imperative that you seek the proper professional care throughout your twin pregnancy. The Twin to Twin Transfusion Syndrome Foundation has helpful information on doctors and family support. We have listed the most common treatments along with brief descriptions. Twenty years ago, the prognosis for babies suffering from TTTS was pretty bleak. Now however, there are more advanced treatments available. For example, in just the last 10 years, a laser ablation procedure has become one of the most effective for stopping and reversing what Twin to Twin Transfusion Syndrome does to unborn babies in advanced stages. The survival rate has gone up to about 70%-90% if there is early detection and treatment. Which is great news! 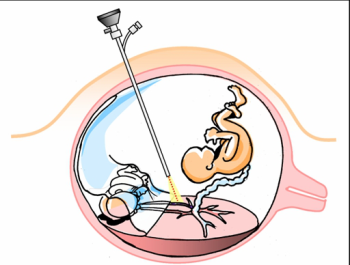 Serial amniocentesis involves the removal of excessive amniotic fluid from the sac of the recipient twin using a needle that is passed through the mother's abdomen. Septostomy is when a hole is made in the membrane between the twins' sacs using a needle. This causes fluid to move from the amniotic sac with excessive fluid (the recipient) into the sac with absent or low fluid (the donor). In some heartbreaking cases, parents may have to make the difficult decision to proceed with the purposeful loss of one baby to save the life of the other. This procedure is used when laser ablation of the connecting vessels is not possible or would not likely be successful. This procedure is usually reserved for TRAP ( Twin Reversed Arterial Perfusion) sequence. This is a rare condition in which one of the fetuses does not fully form and instead results in what's known as an acardiac twin. This twin will have a malformed heart or lack one altogether resulting in the other twin having to overcompensate by their heart pumping harder. This in turn could cause heart failure in the healthy twin and/or preterm labor for the mother. The procedure uses a specialized needle which passes into the amniotic fluid and then into the acardiac fetus. A unique current is then applied to the needle which burns the area around the major blood vessels in the abnormal fetus. Thus stopping the blood flow and allowing the healthy twin relief from pumping extra blood to the arcardiac fetus. It can be difficult to understand exactly what's happening inside the womb, so we have provided an excellent video (above) that explains with illustrations and simple terms the basics of Twin to Twin Transfusion Syndrome. There are also a couple of inspiring videos about families who have had healthy twins after being diagnosed with Twin to Twin Transfusion Syndrome (below). We highly recommend you watch if you are looking for some clarification or answers.